“You don’t think of it as history when it’s happening,” observes Evelyn Yoshimura, as she reflects on decades of activism and organizing work in the Asian American community. Evelyn seems intent on evading credit for the outsized role she’s played in the progressive Asian American movement and legacy of Little Tokyo. Behind a sly smile and red horned-rim glasses, she fires off self-deprecating jokes and praise for fellow trailblazers. “I just try to do the right thing,” says Evelyn. She points out this is also the title of a Spike Lee movie – and “a really good one” at that. By the time she joined LTSC as one of three original staff members in 1980, Evelyn had already begun to make her mark on Asian American history—by helping to wage a successful battle for ethnic studies classes at Cal State Long Beach. In the years that followed, Evelyn marshaled grassroots support behind reparation payments for Nikkei incarcerated during World War II and organized Asian Americans involved in the Anti-Apartheid movement. She has also dedicated herself to ensuring Little Tokyo remains a viable cultural hub for Japanese Americans and other Angelenos alike. Evelyn’s worldview and motivation for becoming an organizer were shaped in large part by where and when she grew up. Living in the Crenshaw neighborhood, Evelyn saw black Americans struggling for equal rights under the law. When Evelyn started school at Cal State University Long Beach (CSULB), she entered an Asian student community at odds with itself. Some Asian students sought each other out for kinship and solidarity. Others, just wanting to fit in, avoided their Asian peers entirely. Evelyn and her friends screened a documentary on the incarceration camps—as a way to stir dialogue among Japanese Americans on campus. Over 100 students showed up and a thoughtful discussion followed. Evelyn’s name was on the flyers, making her a target for anonymous death threats. For Evelyn, this just confirmed how much work needed to be done. Next, Evelyn joined a group of students of color campaigning for ethnic studies in the CSULB curriculum. They wanted their classes to reflect and support diversity. When administrators ignored the group’s demands, the student activists turned up the volume. “We put glue in the locks in their building,” said Evelyn. Matters came to a head when the activists held a protest in the school library. Counter-protesters confronted the group, and a physical altercation ensued. In a dubious turn, two black male students were arrested, despite being away from the center of the conflict. The students were released. One of them, though, died tragically while in police custody related to another protest the following summer. Evelyn lamented the loss of the bright young student and all the squandered potential. She noted he had spearheaded an effort to start summer youth programs in Long Beach prior to his death. In response to the protests by Evelyn and her classmates, CSULB made a handful of ethnic studies classes available. 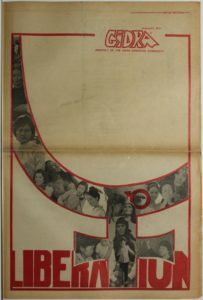 In the early 1970s, Evelyn joined a team of progressive Asian Americans producing Gidra, a newspaper written by and for members of the Asian American movement. Our brothers have been drafted into the military to face fighting and possibly dying in a war that even the legislators of our country cannot wholly support; and for Asian American brothers there is the added contradiction of killing other Asian people in the name of a country that itself is divided in its support of the war. Evelyn takes great pride in her involvement in the U.S. Anti-Apartheid movement in the 1980s. Along with fellow Asian American leaders like LTSC’s Mike Murase, Evelyn worked to mobilize the Asian American community. Protesters staged boycotts at various Shell gas stations on weekends; Shell had invested heavily in South African Apartheid. She helped organize Asian American participation in an annual Anti-Apartheid march along Martin Luther King, Jr. Boulevard. One year, at its height, the march had nearly 1,000 participants with 100 or so Asian Americans among them. Evelyn believed the effort was key to strengthening the relationship between the Asian American and African American communities. Evelyn’s ties to the Little Tokyo Community are extensive. Before she was born, her mother taught piano at the Miyako Hotel. Her father, an accountant, worked at banks in the neighborhood. She recalls going to Nishi Hongwanji Buddhist Temple for Hanamatsuri (Buddha’s Birthday) and eating Chinese food with her family at the Far East Café. So it was fitting that years later Evelyn would work on the formation of the Amerasia Bookstore, which, at the time, was the only place one could find many books by Japanese American authors. 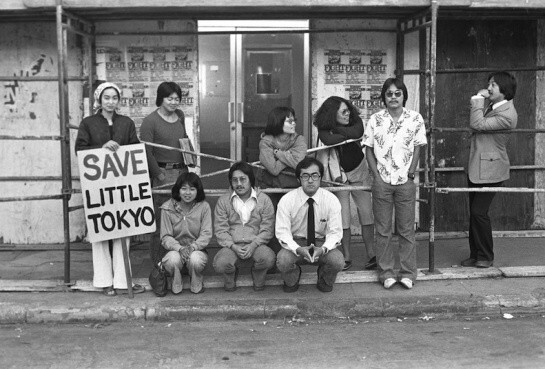 In the 1970s, Evelyn joined members of Little Tokyo People’s Rights Organization (LTPRO) to resist redevelopment plans that threatened to squelch Little Tokyo’s cultural identity. A key battleground for LTPRO and other community advocates was the Sun Building, which housed cultural groups, small businesses and tenants. Developers planned to evict the occupants, demolish the building and replace it with a luxury hotel. LTPRO stood firm on behalf of the occupants, even conducting around the clock patrols to prevent a lockout. The transfer ultimately occurred, but not before Little Tokyo advocates had secured a series of concessions for the occupants and community. 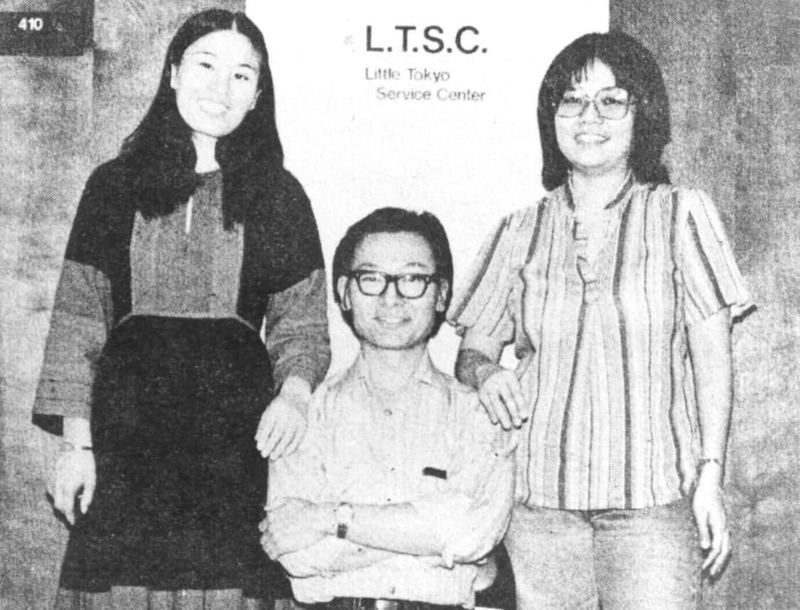 When Evelyn, Bill Watanabe and Yasuko Sakamoto launched LTSC, the drive for Japanese American redress and reparations was front and center in the Japanese American community. Evelyn played an active role in the campaign, organizing community members for the LA Hearings of the Commission on Wartime Relocation and Internment of Civilians, held in 1981. Evelyn points to the fact that her colleague Yasuko worked diligently to ensure the participation of the Japanese speaking community in the redress process. Currently, Evelyn is focused on the latest assault on Little Tokyo, a wave of demand for downtown property—caused by new Metro rail construction and development—that has reduced the amount of affordable housing and small business commercial space. “Everything is always changing,” says Evelyn. “There are new stores popping up, not all of them are Japanese.” In turn, community advocates must grapple with what an evolving historical Japanese American community is supposed to look like. Seeing the continued divisiveness on issues of race, gender and immigration status is sobering. “Haven’t a majority of people dealt with these issues already?” she asks. “It’s not for me to lead the charge anymore though,” says Evelyn, putting the onus squarely on a younger generation to step forward. However, with progressive values under fire, it’s hard to imagine Evelyn staying on the sidelines.